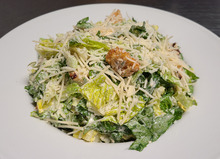 Your choice of chicken on a bed of crisp romaine tossed with Caesar dressing, topped with croutons and Parmesan cheese. 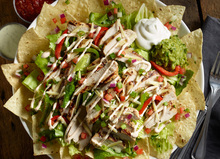 Your choice of protein, sautéed red and green peppers and onions on a bed of salad greens topped with white Cheddar cheese, fire-roasted corn, green onions, pico de gallo, sour cream and tortilla chips. Served with your choice of dressing. Large chicken breast hand-breaded and fried to order (knife and fork needed but worth it!) on a bed of salad greens with cheddar cheese, diced egg, avocado, bacon, carrot sticks, cucumbers, roma tomatoes and croutons. Served with your choice of dressing. 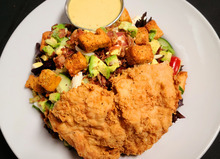 Your choice of chicken on a bed of salad greens topped with cheddar cheese, carrot sticks, cucumbers, roma tomatoes, eggs and croutons. Served with your choice of dressing. Your choice of chicken dipped in our house wing sauce. 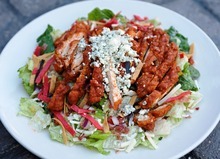 Served on top of fresh greens combined with spiced chopped bacon, white Cheddar cheese, pico de gallo, tortilla strips, tossed with chipotle ranch dressing and topped with crumbled bleu cheese. 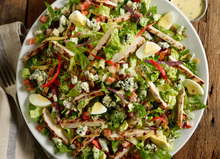 Crisp romaine lettuce combined with grilled chicken, spiced chopped bacon, pico de gallo, tortilla strips, diced eggs, crumbled bleu cheese and tossed with honey lime dressing. Crisp romaine lettuce with red bell pepper, spiced chicken, avocado, roma tomato, carrot sticks, fresh grilled pineapple tossed in dark cherry vinaigrette and topped with sliced strawberries, candied pecans and crumbled bleu cheese. 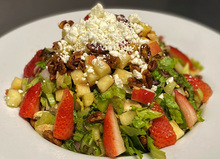 Spring and traditional salad mix combined with grilled chicken, chopped red onion, celery and apples tossed in a balsamic vinaigrette and topped with sliced strawberries, candied pecans and crumbled bleu cheese.